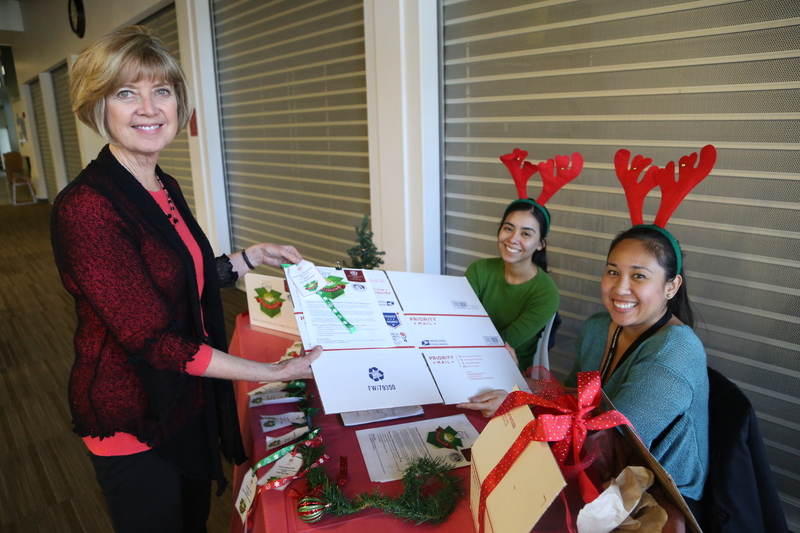 School of Allied Health Professions professor Ardis Wazdatskey, left, picks up a ‘Give to a Giver’ Christmas care package box to fill from Global Health Institute employee Angeli Yutuc, right, and student worker, Karen Hernandez, center. Christmas cheer is being spread throughout the world in the form of large flat-rate postal boxes filled with gifts and goodies reminiscent of home. The fifth annual “Give to a Giver” project is an opportunity for individuals, departments or groups to sponsor Christmas care packages for Loma Linda University Health overseas missionaries and their families. These missionaries are Loma Linda University alumni, Global Service Awardees, Deferred Mission Appointees or Adventist Health International long-term volunteers. They serve in 17 different countries at Loma Linda University Health strategic partner sites as physicians, dentists, hospital administrators, nurses and public health educators. Ardis Wazdatskey, MA, coordinator for the Wil Alexander Wholeness Series at the School of Allied Health Professions, decided to sponsor a box for a physician missionary family in Nepal. Wazdatskey visited Scheer Memorial Adventist Hospital in Nepal a year prior. During her visit to the campus, she helped prepare incoming physician housing by weeding the surrounding grounds. After selecting a missionary family to sponsor through the ‘Give to a Giver’ project, Wazdatskey realized that her care package recipients were living in the same house she had worked to prepare. This year, 55 care packages will be collected and shipped by Loma Linda University Health’s Global Health Institute in collaboration with Students for International Mission Service and the National Association of Seventh-day Adventist Dentists. To learn more about this project, contact Angeli Yutuc, MPH, program manager of international service, at 909-558-4876 or ayutuc@llu.edu.